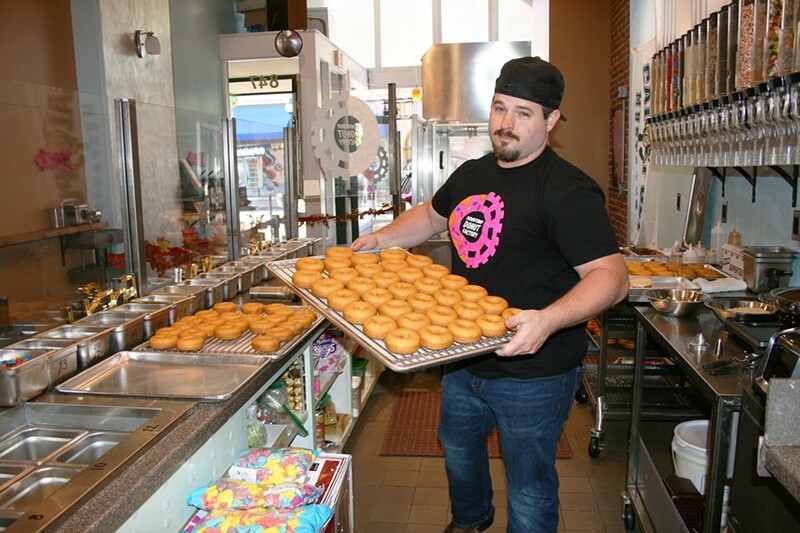 Downtown Donut Factory is open Wednesday 10 a.m. to 6 p.m., Thursday and Friday from 10 a.m. to 10 p.m., Saturday from 9 a.m. to 10 p.m. and Sunday from 9 a.m. to 4 p.m.
Josh Morrow was more than a little annoyed when the guy behind the doughnut counter uttered those three horrible words. DESTINATION DOUGHNUT Downtown Donut Factory in downtown SLO is encouraging your wildest doughnut fantasies out of the dark. Pick your base flavor, pick your toppings, and pick your drizzle. He'd just lugged his wife and kids through Southern California traffic to get to the front of the line at this particular prestigious doughnut shop. The whole family was excited to try a new, remarkable flavor they'd seen on one of those Food Network shows. "It was some sort of blueberry unicorn flavor," he recalls. "The first location we'd gone to was also sold out. This was about two years ago, when the unicorn thing was happening." Infuriating? Yes. First World problem? Totally. But still, this frustration sparked an idea in Morrow, who now owns his very own downtown SLO doughnut shop (located just down the street from his other sweet-tooth biz, Rocket Fizz). "I thought to myself, 'Wouldn't it be cool if you never ran out of a particular flavor? If you brought the kids and you knew—for sure—everyone would always get the exact flavor they wanted?'" Thirteen months later, Downtown Donut Factory opened its doors at 847 Higuera St., in the former Tea Berry location. DOLLARS TO DOUGHNUTS You've got to wake up pretty early to beat Downtown Donut Company owner Josh Morrow to work. 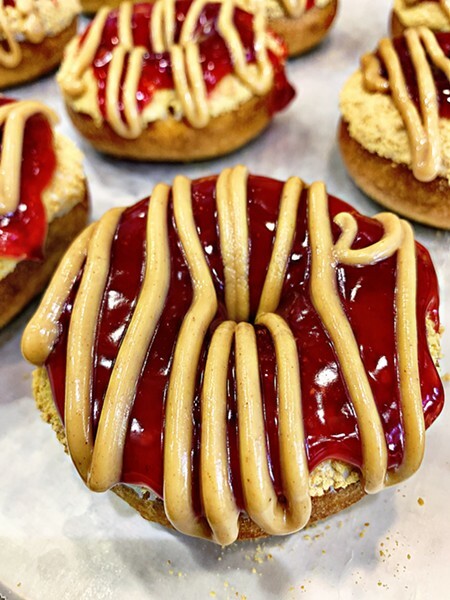 He's always up bright and early with "doughnut chemist" Sam Lopez, churning out dozens of moist cake donuts, which serve as blank canvases for the day's DIY doughnut creations. Just look for the hot pink doughnut sign (and hot pink doughnut merch displayed in the window) a la Homer Simpson's favorite snack. Yes, there's even an inflatable doughnut pool flotation device, in case you were wondering. 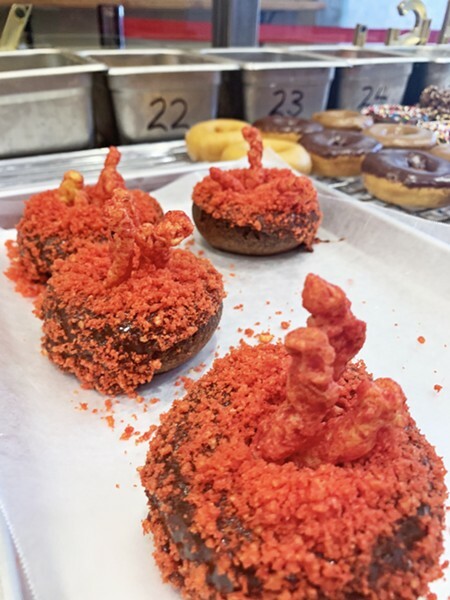 The business concept was simple, yet maniacal: Let customers make whatever doughnut flavors they wanted, just as our American forefathers and foremothers had always intended. With about 40 different toppings, the combinations are mind-boggling—and yes, you can get yours vegan, if you wish. First, pick your base doughnut flavor: yellow butter cake or devil's food chocolate (seasonal cake flavors also exist, from pumpkin to apple, so be sure to ask before you begin to choose your own adventure). Next, pick your icing: maple, vanilla, or chocolate are mainstays—that's easy enough. Then, the chaos ensues. Freedom becomes anarchy. Try not to lose your head as you ponder over bacon bits, cookie dough bites, gummy bears (sour worms, too), toasted coconut, mini Whoppers ... the list goes on for quite a while. Try to keep your composure, because there's more work to be done. Like getting your drizzle on. Yes, you'll get a swoop of glossy, gooey goodness to finish off this sinful treat (there are eight drizzles in total, and you might have a hard time choosing between butterscotch or bourbon caramel). You can applaud millennials for the "customize everything" situation we're seeing in our foodstuffs, or you can roll your eyes. Either way, you can eat here. "A lot of people have embraced the DIY doughnut freedom, but plenty of people just want something already made, which is great. For those folks, we've begun making our daily flavors," Morrow says. "I'm a creative guy and learned a lot of baking and pastry skills from my mom. So, I started making these crazy flavors to inspire people, like, 'Hey, this is what I'm making. What can you make?'" 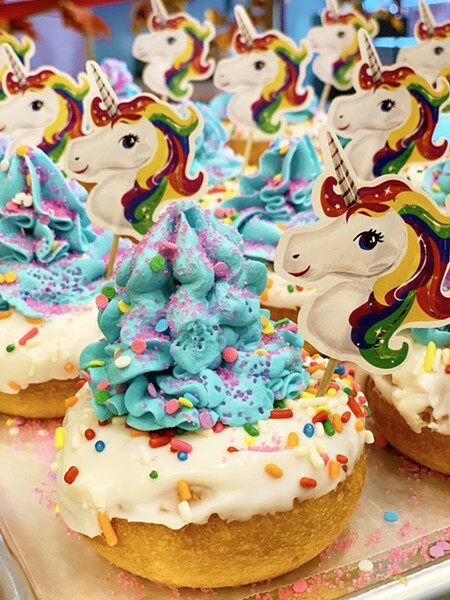 From pre-made peanut butter and jelly doughnuts to a dazzling rainbow unicorn-themed works of art to an orange sphere topped with salty, salacious Flamin' Hot Cheetos, you'll find something fanciful to drool over, to be sure. You can also just pick up a bag of quick and easy cinnamon sugar, powdered sugar, glazed, or plain doughnuts. I mean, that sounds kind of boring considering the other options, but to each her own. One thing that unites all of these different morsels—besides being irresistible when placed in the break room by a diet-sabotaging colleague—is the quality underneath all the edible accessories. You won't find animal fat in any of the doughnuts, and the team is currently working on a gluten free option. "Sam, who I call our 'doughnut chemist,' makes our doughnuts so moist and so delicious," he says. "A good doughnut has to have a bit of give when you press on it, you know? When we release the gluten free doughnuts, we want it to be just as amazing as our regular options." Also keep an eye peeled for a new late-night doughnut window currently in progress, because, well, drinks often lead to doughnuts. Bar hoppers and night owls alike will soon be able to grab a bag of mini doughnuts to share with friends on the 2 a.m. Uber ride home. Yes, because when it comes to doughnuts, Morrow believes the power should belong to the people. Only 100 percent, total freedom will do. Take his new idea, which may or may not become a hit: Doughnuts á la mode, with different flavors of gelato. Because why not add a dollop of ice cream onto your Butterfinger and rainbow sprinkle butterscotch chocolate doughnut? It's a free country. "Even our icings are switched up every few weeks," Morrow adds. "From mango, guava, or Thai tea icing, we're always trying to keep our creativity up." Hayley Thomas Cain is prefers maple and bacon bits, but is up for anything. She can be reached at hthomas@newtimesslo.com.